Somewhat shockingly, the “Metallic Navy” Air Jordan 1s are still very available and are so at a discount. That’s not a bad thing at all, but actually a good chance to stock up on an awesome OG. 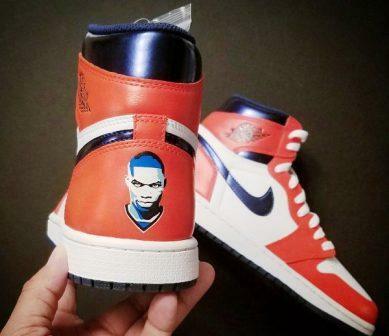 Making the most of the access and a paint brush, Will Payne has taken his pair and turned them into a tribute to OKC’s potential league MVP. Inspired by Russell Westbrook, this clean custom adds the Thunder’s alternate orange shades to the upper of this AJ1 for a “Chicago” feel with definite OKC vibes. To seal the deal, Russ’s portrait appears on the heel.